A few days ago, the Olympic Store — the first of the 8,000 that are planned to open across the country — opened on Moscow’s Red Square. 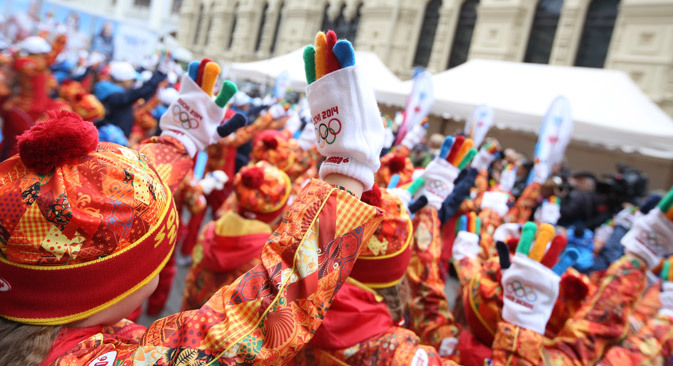 Currently, the store’s best-sellers are bright gloves with fingers in the colors of the Olympic rings and mittens featuring flags of the participating countries. Since 1936, when it was decided to establish the Olympic uniform, the public appearance of athletes has become a matter of a state image and a serious way to demonstrate status. The most "fashionable" of the countries have been known to invite well-known designers to design their equipment: French athletes, for example, acquired their clothing from Pierre Cardin and Yves Saint Laurent, Italian athletes received uniforms from Giorgio Armani, and British competitors were given attire from Stella McCartney. Particularly thorny was the question of the Olympic uniform for the Soviet Union. From the way the Soviet delegation looked, the world judged the quality of life behind the Iron Curtain. The decision on the uniform for the team was made at the level of the head of state and went through a number of different stages — from checking comfort and ergonomics, to fulfilling ideological standards. The creation of the equipment was attended by leading designers of the Soviet Union — employees of the Models House of the Soviet Union, the main fashion studio of the state. Exceptionally bold and avant-garde models did not "go through." On the one hand, there was a desire to dress Olympians in the latest fashion; on the other hand, this fashion was subjected to severe censorship. Yet, even in such difficult conditions, Soviet fashion designers managed to surprise the world. In 1960, in Squaw Valley, Soviet female athletes walked out for the medal ceremonies in slim blue jackets and elegant blue pants. In 1964, in Innsbruck, the Soviet team walked down the plane stairs in luxurious fur coats made of the rarest golden seal! A special love for the Olympic uniform was nurtured in the Soviet Union itself. First, the Olympic costumes were of an excellent quality, impossible to compare to everyday clothing. Secondly, they had a very patriotic look. To get a set of knitted pants and sweatshirts with the proud inscription "USSR" on the back was something widely dreamt of by all. Perestroika and the collapse of the Soviet Union only strengthened the Russian love for the "fashionable" sport. The Olympics became a reflection of the real boom of Western culture (especially clothes) in the country. Long-term constraints had led to a rampant desire to dress brightly and meet global trends. Now, young fashion designers, who were previously deemed “ideologically inconvenient,” were allowed to work on the uniforms. For the 1984 Games in Sarajevo, the uniform design was developed by one such designer — Vyacheslav Zaitsev. In 1994 and 1996, the signature uniforms were developed by the famous (not only in Russia) fashion designer Valentin Yudashkin. Every year, the Russian athletes began to look more and more spectacular. Over just one decade, in the fashion sense, Team Russia rose from knitted sweatshirts (albeit of excellent quality) to aristocratic polo shirts and pullovers made from the finest Italian wool. Now, companies with worldwide reputations work on these designs. In 2004, the Russian team went to Athens in a full uniform that was developed jointly by the company of Bosco di Ciliegi (the official "image-maker" of Russian Olympians since 2002) and the world-famous Italian fashion house Etro. The designers were inspired by the sports uniforms of 1930s. In 2006, the fashion house of Ermanno Scervino joined Bosco and Etro. At the opening ceremony of the 20th Olympic Winter Games in Turin, Russian athletes entered the stadium in stylish red-and-white suits featuring twisting national patterns (down-filled jackets with fur and corduroy trousers by Ermanno Scervino, blazers and knitted vests by Etro, and recognizable accessories by Bosco).